The scent of roses has also come up in previous statue-weeping sightings. Many statue weepings of blood, oil, or tears were eventually revealed to be human-, not spiritual-based. But the inside of this statue was examined and “there’s nothing on the interior that’s not supposed to be there, except for cobwebs.” The fact that the statue is bronze is also a stumper, as the manufacturer of the statue “assured us there would be no possibility of any moisture to remain in the bronze,” stresses Bishop Cantú. True believers offer other possibilities, like the fact that the Virgin Mary may be weeping for the sorry state of humanity or (even worse), evil forces may be involved. The bishop says that some people have reported seeing “beautiful, positive fruits” after witnessing the sculpture. 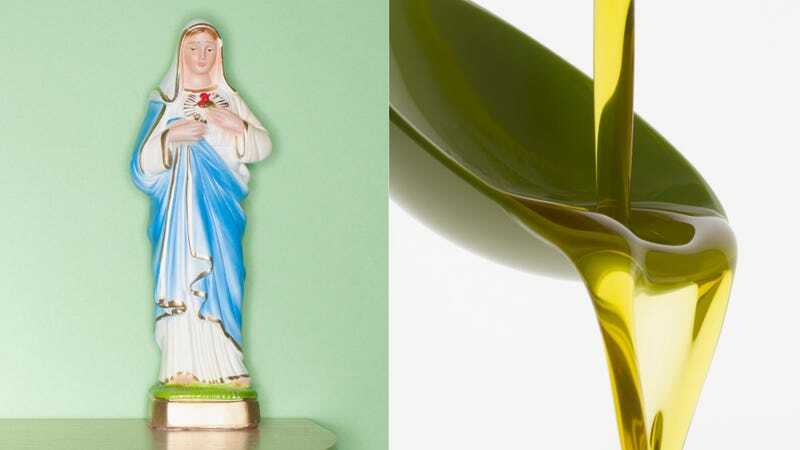 Apparently the Pope has to chime in to call something a true miracle, so until then, the church will undergo further exploration to determine the olive oil tears’ mysterious origin.